For the first time in the illustrious history of the German Football Association, the national team has been knocked out during the first round of a World Cup. Germany were under pressure going into the final matchday, as they had to win their game against South Korea. But once again, Joachim Löw’s team had a hard time breaking through—and if they did so, they were not able to hit the mark from close range. Just like against Sweden a few days earlier, Löw mixed things up in his line-up. Mesut Özil and Sami Khedira, two of his favourite students, returned to the starting XI, with Julian Draxler and Thomas Müller being left out. System-wise, these personnel changes did not have any significant effect. Löw stuck to the 4-2-3-1. Meanwhile, South Korea, who only had a minor chance to qualify for the Round of the last 16, came out the dressing rooms and defended with all they had. Head coach Shin Tae-yong chose to primarily rely on counter-attacks which was emphasised by his line-up sheet. Tottenham striker Son Heung-min roamed around upfront looking for space to run into and hit Germany on the break. He was somewhat supported by the far more defensive-minded Koo Ja-cheol who switched between a no. 10 and a secondary striker role. The Koreans usually defended in a 4-4-2/4-5-1 hybrid, with the two centre-midfielders blocking the middle of the park at first, so that Toni Kroos and Khedira could not just advance without any resistance. Therefore, they often played laterally and got the two full-backs involved out wide. 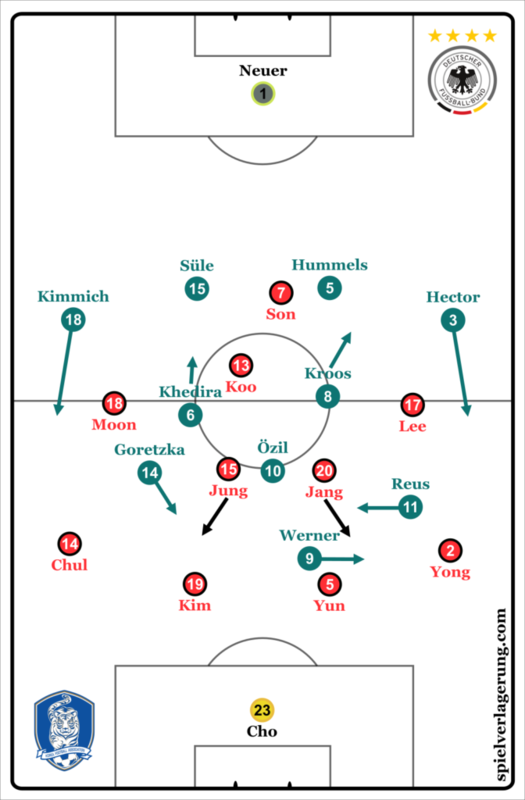 If the lateral pass to either Joshua Kimmich or Jonas Hector was played, the two Korean midfielders—or at least the one close to the ball—dropped back and reinforced the back line. The result was rather disadvantageous for Germany, as they were now stuck on the wing and significantly outnumbered in the box. The timing and discipline shown by both Korean midfielders were key for the defensive success of their team. The Germans were looking for openings and gaps all the time, and Kroos or Özil would have punished any mistake. Especially in the first half, Germany attempted to play more lateral ground passes from the wing towards the edge of the box and surprise Korean with an unmarked midfielder suddenly appearing in the backspace, but that did not quite work out. After 58 minutes, Löw brought on Mario Gómez, and his wingers started to play an increasingly number of high crosses. But before that, the German coach had a different plan to stretch the Korean defence. On paper, he fielded Leon Goretzka on the right side, but the Bayern Munich signing is not a typical winger by any means. He moved into the half-space from minute one, closely positioned to Özil. Timo Werner and Marco Reus were often spread and attacked from the outside. Werner, in particular, made a couple of dribbles on the left, while Goretzka pushed forward and made his presence felt in the box. The Koreans, however, did not buy into it and let themselves exposed—which they could have done, if they had played a rigid man-marking scheme. But instead, the Korean back line effortlessly moved without any positional switches and kept the German dribblers, who could have been a threat otherwise, out of the box for the most part. Löw tried a few things after the half-time break, including bringing on Gómez. As a consequence, Özil moved back and played alongside Kroos for the remaining time. Kroos still had command over the build-up play, though both interacted pretty well, especially when Özil moved a bit to the right and received hard lateral passes from his teammate. Overall, he created seven goal-scoring opportunities in that match and also tried to assist Kroos close to the box, attempting to get him into a perfect shooting position. Nothing worked out for Germany, and as the clock was ticking, the defending World Champions became more and more nervous and took more and more risk. Korean had a few potentially promising counter-attacks in the second half, but showed rather lacklustre decision-making. Moon and Son alone had enough chances and were put in enough situations to seal the deal earlier than they eventually did. As for Germany, their final match of this World Cup underlined the shortcomings of that team. They controlled the ball for the majority of the match and had the intention to be as dominant as possible. However, the necessary ideas to break down an opponent bit by bit were missing. And when the German team had the chances to score they missed. And when the German team made a mistake, it meant trouble—or more precisely it meant that the opponent could counter-attack and make runs against Mats Hummels and the likes. Mexico, Sweden, and South Korea had varying concepts how to get into these situations, but they shared a common matchplan against Löw and his players. With Sweden entering this match even on points with Germany, the expectation was that Sweden required a win to advance to the next round. A draw for Mexico would be enough to win the group. This match was a milestone for fans of consistency in the Mexican selection, as it was the first time that Juan Carlos Osorio had repeated a starting selection through his time in charge. Besides this occasion, it was a less than memorable match for Mexico and a tense closing period as they awaited the results from Kazan. 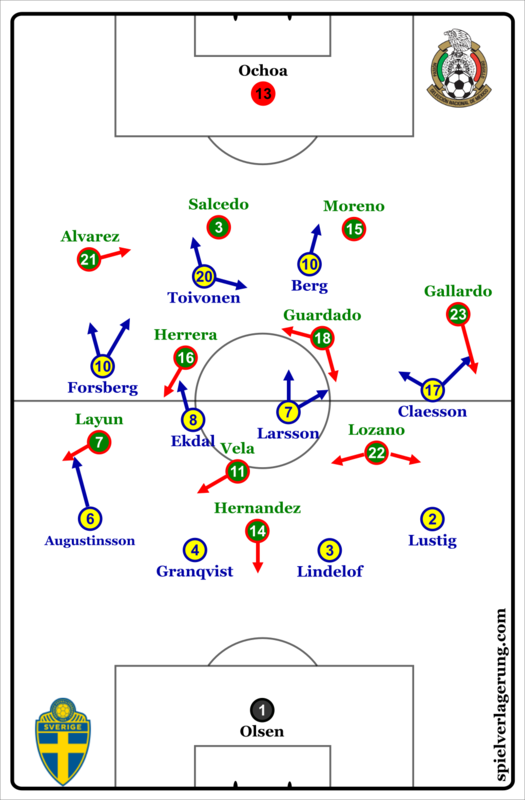 Sweden were aligned in their typical 4-4-2 shape, not confronting to pressure until around ten meters in their own half when Mexico began to provoke Sweden’s first lines in possession. This medium-deep block put most of their team behind the ball, and made Mexico’s attacking efforts in the final third difficult because of the limited amount of space available and the close distances of Swedish coverage. To boost the numbers forward, Mexico adjusted their shape in possession by contributing more focus to central area. As the ball crossed the halfway point, El Tri converted to a 3-1-5-1, as Alvarez moved closer to the middle, Salcedo became the fulcrum with Moreno to his left. Centrally, Herrera and Guardado remained in front of the three chain, with Herrera shuttling up and down the right halfspace into the next line to join the line of five. Layun remained in the wing, and Jesus Gallardo commuted upward to occupy the left wing. For the attacking presences, Hirving Lozano was to be situated in the left halfspace alongside Vela on the right, as Hernandez summited in front of them. Positionally, this put all of Mexico’s players in between gaps of Sweden’s covering scheme, allowing for diagonal passing from the back to move Sweden’s team. Despite Mexico’s advanced players slotting into all the gaps of Sweden’s defensive structure, some apparent issues were found in their possession. Due to Sweden’s high starting positioning with their pressing, any efforts to initiate their play from Ochoa were well covered, as Sweden moved intelligently to use their cover shadows to prevent easy passage into forward options. This led to Ochoa having to play long after passing it to centre backs, before just playing long from goal kicks whenever Sweden stepped up. With the Swedish physical advantage in midfield for winning long balls, these were predominately lost. Mexico were reluctant to dribble past players early in build up, and after close calls conceding possession early in their attack development, they became much more risk averse than what is normally found in their play. The most potential filled moments came from Swedish temporary rest periods that come from transitions and free kick calls, where playing quickly took advantage of Sweden’s expanded shape in attack, but they rapidly recovered to cope with these attacks. A combination of the opponent’s tactics and the occasion impacted the individual choices of the players, causing Mexico to avoid playing their talents in situations that are difficult, but able to succeed in. This led to Mexico becoming more aerially focused with their passing. This led to a less controlled tempo in possession than in the match against South Korea, thus unable to fully implement the positional schemes found earlier in the match. For penetrative balls, they became reliant on long flighted diagonals and passes toward the wings like a target man was playing there. If Raul Jimenez was in these circumstances, Mexico’s outcomes in the disorder of these long balls would’ve been much better, and the large distances in their play would’ve opened up zones for Vela and Lozano to be more impactful given more time. Because of the match context, Mexico deviated slightly from their usual method of playing, while not equipped with the proper players to succeed from such an in game shift. Sweden’s attack was comprised of consistent long balls into Berg and Toivonen, with aggressive charges for second balls from the wingers and central players to gain territory in attacking zones. Given Mexico’s struggles with second balls throughout their time with Osorio, Sweden had good success in this respect, dominating Salcedo and Moreno in these duels and progressing through their means. The wings functioned as supply lines into the strike tandem as well, with their crosses leading to close headers or corner kicks. Set pieces were held in high esteem for Sweden, with all free kicks played directly to the forwards and corner kicks being highly prioritized and forced Ochoa into saves early on. In the team design of Sweden, their strengths resembled the biggest weaknesses of the Mexican side. In our preview of Mexico, some of the weak points of Mexico that could decide whether they advance or not were in the area of defending long balls, attacking transitions, and how often possession was conceded in the early phases of possession. The second half goals from Sweden exploited all three of these flaws to run away with the win. The super Mexican team from the first two matches had finally encountered their kryptonite. The trends from the first half exacerbated once Sweden nicked the first goal, which originated from a lost second ball and Mexico’s overfixation toward the right side of the pitch, giving ample room for Augustinsson to slot the ball past Ochoa. Thus, Mexico began to play into traps as Sweden dropped off from their earlier pressure to a 4-4-2-0, crowding the midfield and lanes into forwards. Upon receiving the ball, Hector Herrera would have multiple players surrounding him, a remarkably difficult situation to solve in its own right; add suboptimal orientation when receiving the ball and the challenge grows. After going one goal down, Mexico increased the tempo of the match through their circulation and increased directness with their passing and dribbles. Shortly after this new approach, a poor choice from Carlos Salcedo when receiving the ball in the midst of Sweden’s attacking transition spurred their second goal, where Hector Moreno slid and conceded a penalty. He will miss the next match, and Sweden double their lead in the process in a painful goal to concede at this stage. To complete the trifecta of weak points and errors, Mexico conceded relatively early in their possession, and Sweden’s counter attacking moved resulted in a throw in. A long throw into the penalty area led to Edson Alvarez being forced to deal with the second ball while facing his goalkeeper, leading to a comical own goal. Their fate was out of their hands now. Mexico advance thanks to the the valiant efforts of the South Koreans. Not the ideal circumstances considering now they face Brazil, a heavy favorite in their match up. This match was a match where Osorio veered from his rotational principles, perhaps to please other stakeholders, and it came back to haunt him in the end. With Moreno having to miss next match, Osorio will be back to rotating, except it will not be his choice and he will be missing their defensive constant throughout his tenure. Sweden won the group with this result, an unlikely proposition entering the tournament, now paired against Switzerland for the Round of 16. Of all the tactical trends of the tournament – Sweden resemble the highest level of success that comes with deep block defending and a counter attack heavy attacking strategy. The underdog sides that hoped to steal points from the traditional elite will look to Sweden’s example as a role model if all they are after is results, as there have been teams that play much prettier football in similar circumstances. But beauty doesn’t win matches, effectiveness does.